Blinded by the light? Absolutely not. The children of Titchmarsh School weren’t phased by it at all. In fact, they were all very happy to spend a day painting with it. Today, four electronic painting workshops using the iPad following the same timetable as Monday, and the day began by working with the Year 3/4 group. Everyone looked different this time though, it was a dressing-up day and each child appeared either as an artist or as a famous painting. I took on the persona of Jack the Dripper, aka Jackson Pollock, however this was in appearance only, I didn’t spend the day drinking and was determined not to crash my car on the way home! As with the previous workshop this session was followed by working with a Reception year group, Year 1 and Year 2. Each session began with an introduction to the Brushes app. and gaining familiarity with the brush, eraser and colour palettes. The workshops included directly drawn ‘paintings’ as well as working with captured images relating to their special topics. Many dirty fingers but some successful images as a result, from four drawing workshops using charcoal. The day began by working with a Year 3/4 group, followed by Reception, Year 1 and finally Year 2. Each session began with an introduction of mark making exercises and concluded with the production of a drawing relevant to the special topic currently being investigated by each group – Ancient Egypt, Are We There Yet?, At the Seaside and Stonehenge. I would be very interested in commissioning you to come and do a mural at our school or even an artist in residence if you do such a thing. Another opportunity to work on a large scale, I was champing at the bit. A meeting with Josie was arranged for 25th March and following a tour of the school we discussed a variety of options for the contribution I could make working as an artist in residence. 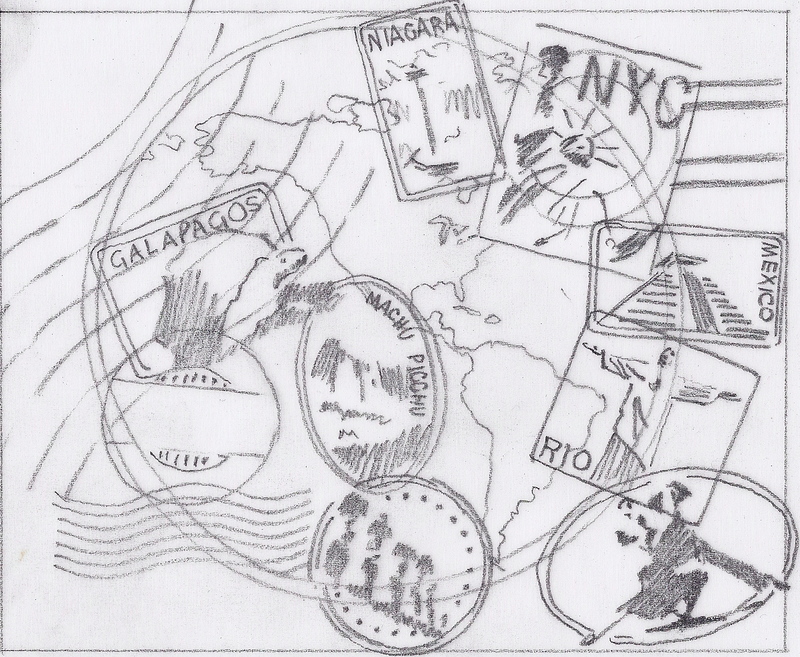 The first was the painting of a mural to enliven a small corridor, a map of the world being its main subject. It needed to be vibrant and possibly include illustrations of landmarks to encourage children to remember such elements as capital cities, events and locations associated with classroom topics. The painting could spread on to surrounding walls, possibly like a splashed puddle or ink blots. The second suggestion was to lead some drawing workshops for each of the year groups. One day would therefore be set aside for working with charcoal, with a second for drawing electronically using the iPad. With wall measurements and photographs taken of the proposed site I returned to my studio to consider and develop a plethora of scribbles for the corridor mural, and eventually settled on an idea based loosely upon a page of my passport. 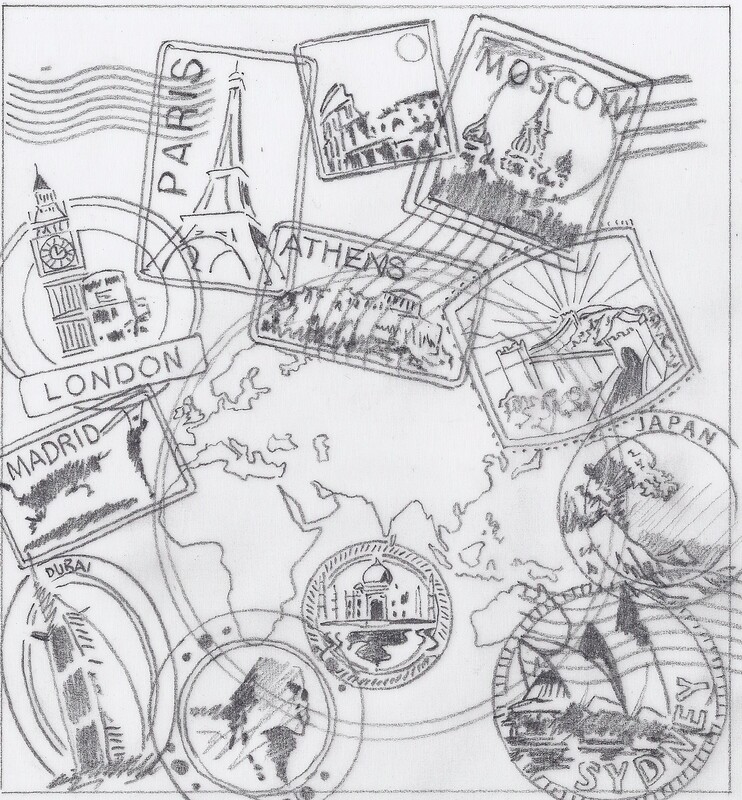 A coloured background featuring two world maps would imitate the graphic texture and watermark of the page, which would be overpainted with a series of specially designed cancellation ‘stamps’, as though travelling around the world. A second meeting with Josie was arranged, who then discussed the idea at a staff meeting in relation to the school’s creative curriculum. 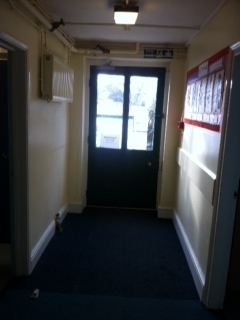 Both staff and children put forward additional and alternative suggestions. I drew another version of the composition to include the alterations and adjustments, and all was in place for another ‘Bigger Picture’ project!